North Fulton Community Charities (NFCC) supports community action to address the health, food, housing and transportation challenges of those we serve. 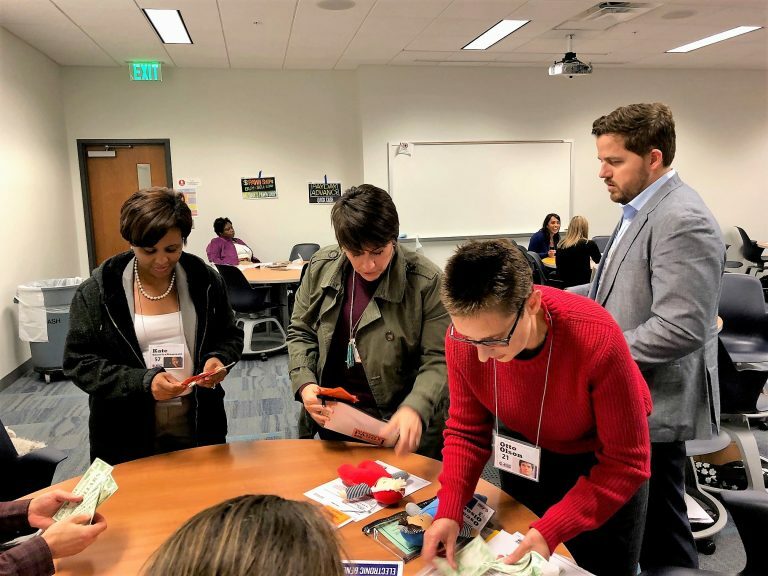 A Poverty Simulation is an exploration of the challenges that families in poverty (like NFCC clients) face every day. Participants are divided into family units reflecting pre-assigned skills, income, housing and a variety of stumbling blocks. They are given tasks to complete in a two-hour role-play. Volunteers run the community tables like Employment Office, Transportation, Jail, School, Charity, etc. During the simulation, challenges arise and participants must decide what to do. There are laughs and frustrations along the way. At the end, the group will discuss what they experienced and learned. NFCC supports programs that impact access to food for North Fulton low income residents. To maximize our influence, NFCC collaborates with the Atlanta Community Food Bank on shared priorities, including protecting tax provisions that encourage charitable donations; supporting summer meal programs for children; preventing access barriers to public assistance programs for qualified individuals and families; increasing access to healthy food and promoting economic security and opportunity for all Georgians. NFCC supports the need for an adequate supply of safe and affordable housing for residents in order to ensure a stable local workforce. We encourage our political and community leaders to support a wide range of housing options including incentives and opportunities for mixed use and mixed income housing to ensure teachers, police, firefighters, municipal employees, young families, millennials and empty nesters can live in the community where they work. NFCC supports continuation of the Deferred Action for Childhood Arrivals (DACA) program and supports legislation that protects recipients from deportation. DACA was created in 2012 to help young undocumented immigrants, who arrived into the U.S. as minors and lived continuously in the country since June 15, 2007, obtain a renewable two-year deferral of deportation proceedings along with a work permit. NFCC supports health care coverage for all Georgians. This may be accomplished by the expansion of Medicaid or an alternative state waiver program such as those being implemented in Arkansas, Indiana and a number of other states. NFCC supports the expansion of transportation options in North Fulton. Bus links are needed to connect the East and West sections of North Fulton.